Schumacher (pronounce: Shoomahhhuh) and Schwarzenegger (Shwartsenegguh) and Schiffer (Shiffuh) helped to make people pronounce the German `Sch' just like the English `Sh', and the ending `er' more or less like the English `uh'. This made life easier for other ex-pats with weird German names, such as Schmidhuber (Shmidhoobuh). 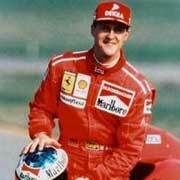 Schumacher has the highest salary of any athlete (source: Focus 36, 30 Aug 2004). He dominates the world's most expensive and second most popular sport, after football (soccer). Every other week more than 300 million people tune in to observe Schumacher's actions for two hours or so - the 1999 Formula One cumulative viewing audience was 57.7 billion (source: BBC Sport). This pretty much makes him the planet's most watched person. Though you can't see much of him in his helmet.